operates power-driven baler or pump used for extracting water and oil from drill hole during drilling operations; erects, by hand, troughs or conveyors from drilled hole to containers or receiving tanks. drills holes for artesian wells with special machine drill, through impermeable strata, e.g., chalk, to permeable stratum, e.g., greensand; erects tackle, i.e., steel derrick, over spot where drilling operations are to take place; connects shafting from power drive of stationary engine to derrick; connects drilling or boring tools to sections of rods; as drilling proceeds, lengthens rods by bolting-on more sections; controls hand levers of mechanical drilling apparatus; uses various mechanical or hand-manipulated devices for hauling-up or lowering rods and drills; if necessary, inserts steel tubes in drilled hole, bolting various sections together as required; regulates power operating mechanical "shell tool," or sludge pump, for drawing-out debris during drilling. makes trial boring to test probable mineral wealth of prospected mine for mine sinking contractor; as for borer, artesian; sometimes makes observations of direction of bore, using direction finding apparatus; cf. borer (054). works on derrick or staging, fixing rigging, assisting driller, etc. ; may also keep pump or baler in good repair. drilling often done by wellman (079) (q.v.). operates machine drill to sink the borehole down to oil bearing rock; adjusts "jars," i.e., lengthens drill as boring proceeds; lowers pipe to line sides of borehole where inis is necessary; usually works under instructions of the driller in charge, who is responsible for drillings, derrick management, and power plant on alternate shifts. a driller (q.v.) or assistant to driller who operates the "runner" tackle for lifting rods for each fall of drill stem in boring operations. 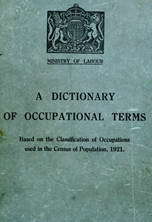 usually a miner (hewer) (042 or 054) (q.v.) who excavates earth and rock with pick, machine drill and blasting to sink pit shaft in mine; sometimes only directs operations of drilling and excavating. digs out with pick and shovel, clay, gravel, etc., down to impermeable stratum, e.g., chalk to sink a shallow well for water drawing with winch and bucket, or for village pump, etc. ; for artesian well sinking, cf. borer, artesian.